I was amazed to ﬁnd out that a friend’s grandmother was 83 years old. She didn’t look a day over 60. She spent a lot of time working in her garden in the sunshine, but she always wore a wide-brim hat and long sleeves to protect her skin. While I was browsing RVs on Craigslist, I found this photo of a clever valance. Even camping can be glamorous! You can make a quick valance or curtain topper to perk up any space. 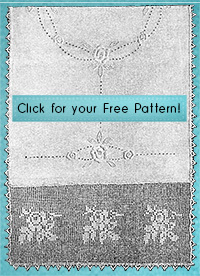 I love the editor of the magazine where I find most of the patterns that I publish. When someone writes in to ask a question about a pattern, she often begins her replies with “I scarcely see how the instructions could be more clear…” or “This answer has been given so often that it hardly seems necessary…”.